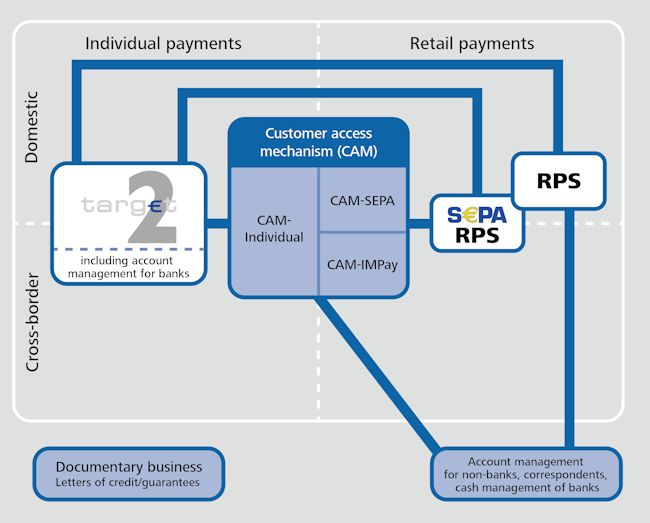 Efficient and secure payment systems are the foundation of stable financial systems. The German Central Bank secures and monitors cashless payment transactions in the financial markets in Germany, provides processing and clearing services, and participates in the further development of a standardized payment transaction system in Europe. 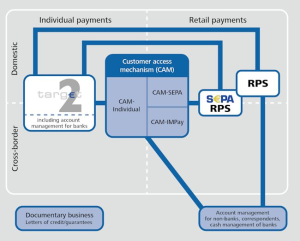 To fulfil these requirements, a payment landscape has been provided and will continue to be provided by the German Central Bank, which will secure national, Europe-wide and international payment transactions for single as well as bulk payments. A continuous development of such a payment landscape took place over the last 15 years. The best-known developments are surely the development of TARGET2 and the on going development of T2S. In collaboration with the different TARGET systems, and in part also independently, clearing and payment transaction functions were developed and put into operation that work together with these systems or use liquid assets from these systems. R&L, part of the Be Group, has actively participated in these activities throughout the last 15 years and made significant contributions to the design of business processes, system designs and their technical implementation. provides all of the required master data to individual users for payment processing (at the basic level, > 20 applications). allows at any time comprehensive information about user or systems and the usage of the payment systems within the German Central Bank (in the basic level approx. 500 user/systems, distributed all over Germany). defines the key requirements, for reorganizing various company divisions to concentrate the administration of master data management in one company unit (5 company divisions at 2 locations). Our team has been involved in and has shaped all of these developments from the first step until today. This includes tasks such as technical and methodological coaching of the staff, participating in data and process modeling, technical specifications and migration as well as drafting test methods and test scenarios.